Former Liverpool youth left-back Calum Woods has signed a two-year contract with Dunfermline Athletic. 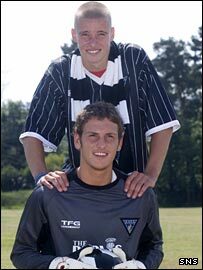 Woods impressed on trial during the Pars' pre-season matches. Fellow 19-year-old Sean Murdoch has agreed a two-year extension to his Pars contract but is likely to be farmed out on loan in the coming season. But Dunfermline have yet to reach agreement with former Bradford City midfielder Owen Morrison, who has also impressed Pars boss Jim Leishman. Leishman is, though, hopeful of concluding negotiations with former Den Haag goalkeeper Dorus de Vries. He has targeted two players, one from Portugal and another from the Netherlands, after watching a series of matches involving 80 free agents from five countries in Holland. "We are interested in a couple of players from Portugal and Holland," he said. "Now we are awaitng contact from their agents and, if all goes well, we'll get them over here so we can have another look at them." The Pars boss wants to add at least two more signings before the start of the season. He views Woods as a long-term prospect rather than someone likely to challenge immediately for the first team. Woods had joined Dunfermline along with former Anfield youth team-mate Robbie Foy, but the midfielder failed to win a contract. Former Fulham midfielder Neale McDermott, former Manchester City striker Karl Bermingham and former Morecombe defender John Hardiker also had unsuccessful trials.